The Fremantle Esplanade Youth Plaza skate and parcour park celebrated its fifth birthday today. Great to see so many very young people attending and loving the exciting sport. I was asked by a City of Fremantle officer why I had mentioned in a blog post early this week that the majority of new Fremantle Youth Network members are female. For two reasons. It is a fact, and I like it that in a time when political partied quarrel about female quotas Freo has a Youth Network with a lot of young women in it-and five young blokes as well. Let’s not forget also that the 13-member Fremantle Council only has four female Councillors, so I am all for more women power! The Fremantle Esplanade Youth Plaza is five years young this weekend and that will be celebrated with a skating festival on Sunday the 14th of April from 12-5pm. This is part of WA Youth Week which runs from the 13th to the 20th of April. Fremantle Mayor Brad Pettitt said Youth Week had always been a popular event with young people, and this Sunday was shaping up to be a fantastic festival with a range of engaging and fun activities planned. The family-friendly event will include a skateboarding competition in association with Skateboarding WA, slacklining and parkour workshops, fascinating virtual reality stations, live interactive street art, Hip Hop classes, market stalls, amusements, etc. The new Fremantle Youth Network members will be at the EYP surveying the community, so come along and have your say. The City’s Esplanade Youth Plaza provides many free skateboarding and parkour workshops throughout the year, and is known as one of the best youth facilities across the country. For more information about EYP Festival 5.0, visit the What’s On page on the City of Fremantle’s website. To keep sponsoring the more and more successful Fremantle WINTERWORLD Festival we should get some guarantee of exclusivity, Councillor Rachel Pemberton argued at the FPOL Committee on Wednesday evening. There is a Winterworld in Perth and Hillaries at the same time as Fremantle, she said, and we don’t want another one at Bibra Lake or near Fremantle..
Winterworld this year will for the first time coincide with the Fremantle Festival, which has been moved from a summer to a winter festival, so that means more and better promotion for the festival. The Winterworld organisers have again asked for cash sponsorship of $ 25,000 from the City plus $ 45,000 of in-kind sponsorship for a waiver of car park fees at the Italian Club, so a total of $ 70,000. The proposal is for a three-year sponsorship up to and including 2021. Councillor Doug Thompson was the only one who does not like the cash sponsorship, but the FPOL members asked for the CEO to renegotiate the contract, because a more successful Winterworld creates more profits and hence should be able to do with less financial sponsorship from the City. 80,000 people attended Winterworld last year and it is estimated 100,000 will visit it this year. I think it is quite funny that the City officers claim in the agenda that “the event created strong attendance from interstate” but the figures provided with the statement show that only 300 tickets were sold interstate, so that is hardly a strong attendance from the eastern states. And one more issue I have been raising since Winterworld started. Where are the posters and flyers so that tourist destinations such as the Roundhouse can hand them out and make interstate and overseas visitors aware that the skating festival is on? There will be Ladies Skate Nights for 16+ the next three Tuesday of February: 6, 13, 20. So get your skates on all you gorgeous Freo females and head out to the Esplanade on Tuesday evening. Just a little Freo’s View free community service and promotion for two new businesses in Fremantle. 1991 Skateshop has opened shop at 7/2 Cantonment Street and is a core skateboard shop. Owned and run exclusively by skateboarders, 1991 Skateshop has a huge range of skateboard decks, hardware, shoes and apparel online and in store. Little Polkadot Pantry at 147 South Terrace is the home of Perth’s first artisan marshmallow salon located within The Coop @ The Corner Store. It features a beautiful handmade marshmallow centric menu created by some of the most exciting pastry chefs in Perth. With a focus on local and small batch a carefully curated daily menu (inc sweet & savoury) features along with a pantry stocked with local artisan goodness. A fine selection of Seven Seas Tea & Karvan Coffee is available from “Betsy” the marshmallow pink Wega machine to compliment the artisan treats along with a healthy dose of good old fashioned service. Support our local businesses. They are doing it tough! WINTERWORLD A LOT OF FREO FUN! Fremantle WINTERWORLD on the Esplanade is a lot of fun, so don’t forget to go there. There is no greater pleasure for me than seeing happy children and they love the ice skating, the big slide and also the snow dome where they can build a real snowman. There is mulled wine and spit roast, coffee, cakes and other yummy things and the Esplanade Youth Plaza skatepark next to Winterworld is also heaps of fun. Comments Off on WINTERWORLD A LOT OF FREO FUN! Snow is falling in Fremantle at the Winter Festival at the Esplanade and kids and grown ups love it. The ice rink is a lot of fun and there is also a slide on real ice. Hot chocolate, mulled wine, slow cooked beef and pork and the National Hotel bar open will make for a fund day and night out. 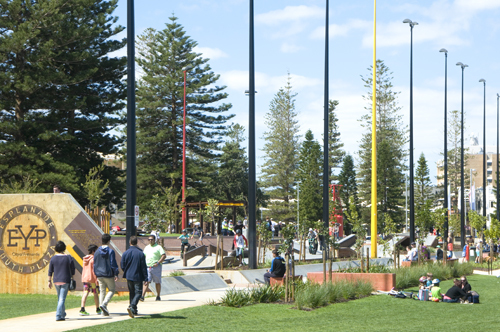 It is really good to see how popular the Fremantle ESPLANADE YOUTH PLAZA is. The place was packed today with kids and families, doing all sorts of activities, and a couple of police officers also keeping an eye on it. But it is a very peaceful and respectful environment at the EYP and that is one of the best things of it all. 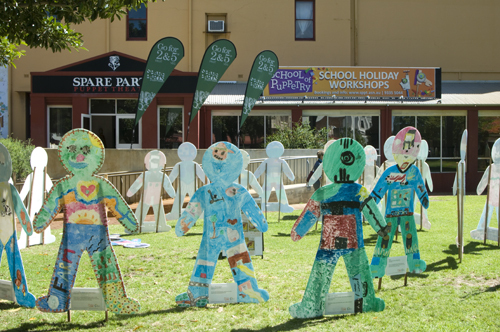 At the Spare Parts Theatre the FARM play is on but also the School of Puppetry doing workshops for kids, and outside in Pioneer Park there are big colourful figures made by the people of the wheatbelt town of Merredin.